2007 Presidential $1 Coin Proof Set. US Mint item number PD0. "A new series of $1 coins honoring the Presidents of the United States in the order that they served began in February 2007. To commemorate these historic coins, the United States Mint is striking and issuing a set of four Presidential $1 Coins per year in proof condition. 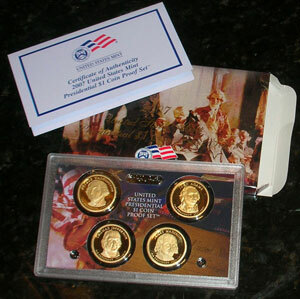 Images of the first four presidents, Washington, Adams, Jefferson and Madison, appear on the obverse of the first set in 2007. Each coin has a reverse design featuring a striking rendition of the Statue of Liberty. These coins also feature edge-incused inscriptions of the year, "E Pluribus Unum," "In God We Trust" and the mint mark. The size, weight and metal composition of the new Presidential $1 Coins are identical to that of the Sacagawea Golden Dollar. This set is a shining embodiment of the United States Mint"s commitment to quality and excellence. United States proof coins are extraordinarily brilliant, with sharp relief and a mirror-like background. Their frosted, sculpted foregrounds give them a special cameo effect. Proof blanks are specially treated, polished and cleaned to ensure high quality strikes. The blanks are then fed into presses fitted with hand-polished dies and struck at least twice to ensure sharp relief. The coins are then packaged in presentation cases to showcase and maintain their exceptional finish. "